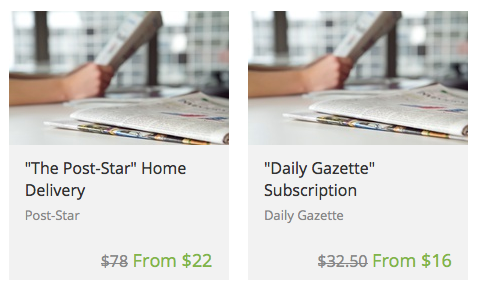 If you buy the Sunday Times Union for coupons you can currently score a 20 week Sunday subscription for $27, which equals out to $1.35 a paper! Expires 180 days after purchase. Limit 1 per person. Must activate by the expiration date on your Groupon, subscription expires 20 weeks from activation date. Valid only for option purchased. Online redemption required. New subscribers only. Must provide complete mailing address at checkout. Valid only in listed zip codes. Customers outside delivery area may purchase this deal to receive Times Union e-Edition via email. Allow 5-7 business days for subscription to begin. Tax not included. Credit card required. Extra fees required. See additional fine print. Merchant is solely responsible to purchasers for the care and quality of the advertised goods and services.